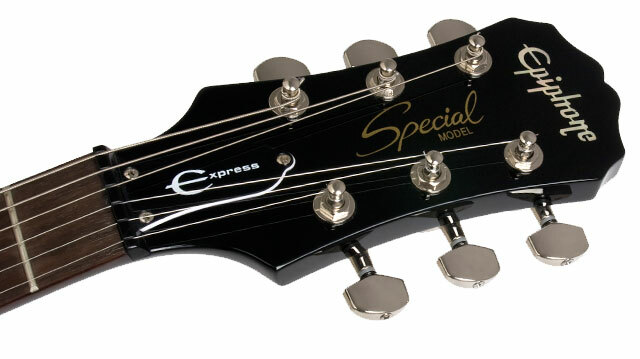 While the new LP-Express is still a true Les Paul at heart, Epiphone incorporated some unique design features to ensure that the guitar performs well for beginners as well as professionals looking for a travel guitar. While the body is made from Mahogany like most classic Les Pauls, the neck on the Express is Okoume as opposed to a traditional Mahogany neck. This gives the guitar a little more high-end "bite" or brighter tone which effectively offsets the slightly looser string tension due to the shorter scale length. Additionally, the fully-adjustable Epiphone FB-601 "fixed" bridge makes string changes a breeze. Finally, the neck is bolted in place securely using four recessed bolts set into a tapered heel making upper fret access easy and comfortable. 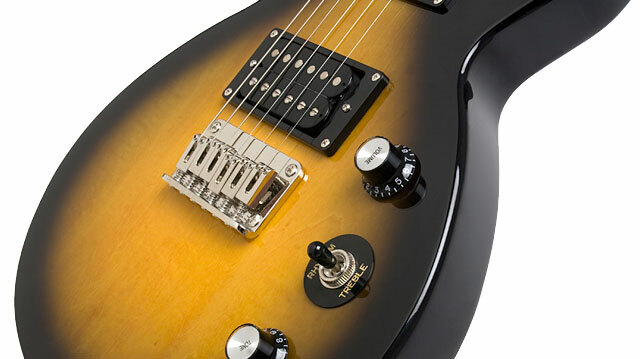 The Les Paul Express features an Epiphone 650R humbucker in the neck position and an Epiphone 700T in the bridge position. Both pickups share the same qualities as Seth Lover's original PAF humbuckers of the late '50s and feature Alnico pickups that give you an infinite variety of tone colors and sounds. With the slightly looser string tension, its even more important to have great machine heads. Epiphone designed the new Express with premium, 14:1 ratio die-cast machine heads to give you excellent tuning accuracy and stability.